Truer words have never been spoken. Even 25 years later, all of us can vividly recall that last minute. Those three goals. MacTavish against Bure with 1.6 seconds left. The 1994 Rangers will be honored tonight before the Rangers take on Carolina. All of them will either be there or be represented there. It’s going to be a great night to remember a team that won it all, despite the spotlight, despite the pressure, and despite the chaos behind the scenes. Curtis McElhinney gets the start. Mike Richter gets the start. Injuries/Scratches: Alex Karpovtsev, Joey Kocur, Eddie Olczyk. Crazy Prediction: Messier doesn’t cry. Game time is 8pm. Ceremonies begin at 6:15. "Game 54: And this one will last a lifetime", 3 out of 5 based on 4 ratings. I wonder how that great Ranger team would have faired against even a mediocre Caine’s team from today? My best guess is the speed (and puck possession) from today’s players is too much for the champion 94’ Rangers. I’m thinking the Caine’s would be too quick to the loose pucks. Fact: Messier was a better skater in 94 than most NHLers today. Is the team named after Michael Caine? And that’s why you call the ‘Canes “the Caine’s”? Nice work. Love our lineup for tonight’s game! The answer to the question above is that the old team would have struggled with the size, speed, and puck handling of the players of today. On the other hand, these players today don’t have the heart of those old work horses, especially Mess who was just driven to win, at all costs!!!! The answer to the question above is the 94 team would have killed em , puck possession is Buttmans change of the game. Those days lots of clutching and grabbing. Lots of grinding and they actually used the body. The new NHL teams of today wouldn’t know how to handle that. Each team was 13-14 players deep with talent. The D actually played D and if you dared to go near the front of the net you better be ready to pay the price , not a stick check. The 94 team probably would have struggled against the new butterfly style goalies, wouldn’t have taken long for them to adapt. That 90’s era the pads were some 14-15 inches wide down low , gloves were way bigger as well but they were exposed and not a tight down low percentage type goalie of today. Along with the size , back then there wasn’t giant goalies when down on their knees shoulders were below the crossbar. Put some wood sticks in these guys hands of today and the game would change completely! Will we be under the salary cap tonight?? No joke,when Sam said “This one will last a lifetime,” he jinxed the team to never win another one during the lifetime of anyone alive before 1995. Just a glorious trip back to memory lane. Didn’t Canes trade away Rask for Niederreiter few weeks ago? Shattenpants doing his best tonight to create a roster opening for Neil Poink. Eddie O in the interview talking about the 94 Rangers and the importance of not only having a team with stars but also foot soldiers who add character. IMHO the current Ranger club could use a couple more foot soldiers as they are still a AV team of softies and need a bit more sandpaper. Carolinas Fogilthorpe left wide open in the slot snaps a shot pass Lundqvist. Ranger need to cash in on their chances. Missed it as my goalie grandson (#30 naturally) had a big game. Sounds like other than Hank the team was a bit of a no-show. Too bad as I’m sure the pregame celebration was terrific. Will have to watch that at least! It was a well played game, and the score is misleading. They scored 2 empty net goals in the last 2 minutes or so. Their goalie made some fine saves for them all game long as well as #74 for them, especially on that open net save he made!!!!!!!! They are building a nice team in Carolina, a few pieces and they are liable to become pretty good. They played tenacious team defense tonight. Our boys did too most of the game. I don’t think it was a case of not showing up, rather, the Canes played quite well. They need a goalie, like they have for about 5 years now. 1) The Rangers have beaten Carolina like 248 times in a row. 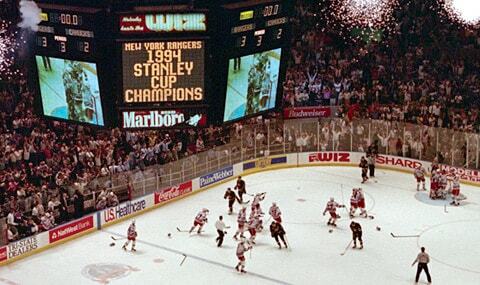 2) The 1994 Cup celebration was last night. 3) Ranger greats were in the house. 4) The crowd was the loudest it has been all year. And the Rangers crap the bed, not scoring one goal against that vaunted Canes’ back end. It was great being there, though. Very happy to see Neil Smith back in the Ranger family. Tragic, his son taking his own life at a very young 21. And great tribute for Karpotsev. MSG does know how to do celebrations right. Very nicely done.